Just Another Day in Japan: Merry Christmas, Mr. Lawrence! Now and then I'll find a strange or interesting-looking Japanese movie on Netflix. 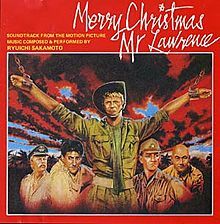 Today I watched this 1983 Japanese/British film called Merry Christmas, Mr. Lawrence (in Japanese, 戦場のメリークリスマス). Featuring David Bowie and Beat Takeshi, the film is about a Japanese prisoner of war camp and its (mostly) British inhabitants. I'm kind of at a loss to describe it, actually. There's a lot of strangeness and violence, and the brutality of the Japanese soldiers is off-putting even if you've seen these kinds of movies before. Still, the relationships between the characters, particularly the British liaison officer (the titular Lawrence) and the Japanese sergeant (Beat Takeshi) are somewhat complex. This movie certainly won't appeal to everyone, but if you like war movies that are a bit deeper and don't mind the fact that this one is a bit violent (despite no firefights) and reflects pretty badly on the Japanese side, you may enjoy it. As a side note, there is a lot of spoken Japanese throughout.